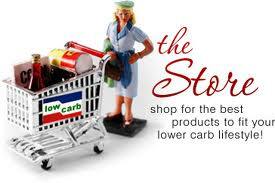 Some low carb items are easy to find at regular stores. However, it is hard to go to a store and find low carb pasta, sauces, hot chocolate, etc. So, you have to go to either a specialty store like LoCarbU.com, a neighborhood one like the Sugar Free Market near my house (go where diabetics go), or other places online like Netrition.com, Carbessentials.net and even Amazon. Type in what you are looking for, like “Low Carb Tea Crackers.” Things will pop up. Not all things are expensive and you can price compare. You can go to Rite Aid or Lindora.com to buy some of their products. Once you buy from Lindora.com, you get on their mailing list and they will send you emails on sales. They do one almost every week. So, you won’t have that much trouble finding things. And don’t forget that for bread, the best options for LOW carb bread is one from JulianBakery.com, Sara Lee 45 Calorie Wheat Bread, Western Bagel Perfect 10 Bagel, or Low Carb Tortillas (shop accordingly). You have to find new things and new places, but after a while, you will learn where to buy what and it will come very easy to you. You have to start first! Browse! Send me your finds!